Our experts welcome you at the 8th symposium "Der Bausachverständige" (The Building Expert) in Cologne on June 5. The focus of this year's event is on indoor pollutants radon and asbestos. In fire situations, firefighters are exposed to a variety of hazardous substances, including asbestos. 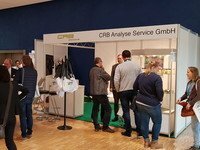 In cooperation with the MeyerundKuhl specialist laundry, CRB has developed a test procedure to check whether fire-fighting textiles can be sufficiently decontaminated by washing and impregnation. 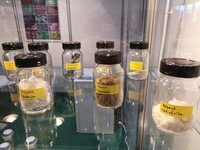 We report on our impressions of DCONex 2019, which took place on 30 and 31 January in Essen. For the first time we were represented at the fair with our own stand. 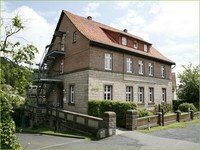 As a member of the Verband Deutscher Untersuchungslaboratorien e.V. (vdu) we would like to draw your attention to an interesting training on the topic "LAGA PN 98" in September 2019. If you are interested in attending, please contact the vdu until March 1st. In order for international interested parties to recognize us easily and quickly as a trustworthy supplier, we have had our end customer shop tested according to the quality and safety criteria of Trusted Shops. Our laboratory will be closed on 24 and 31 December. On 27 and 28 December, however, we will be on duty for you at the usual times. 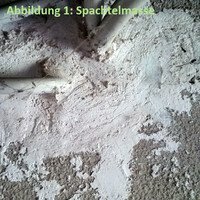 When renovating asbestos-containing floor coverings, asbestos-containing adhesive residues often remain after dismantling the floor coverings. 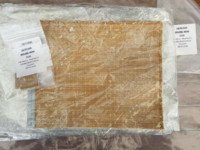 This adhesive must not merely be covered or sealed, according to a decision by the Arnsberg Administrative Court. 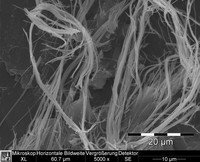 Dr. Gunnar Ries and Dr. Stefan Pierdzig take part at the 'Round Table' of the SBB to examine tarboard waste for carcinogenic fibres. In September 2018, the AEG and IAEG held a joint congress in San Francisco. 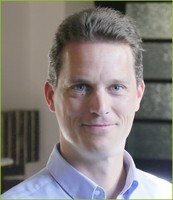 Our colleague Dr. Stefan Pierdzig gave a lecture on asbestos and reported on his impressions. 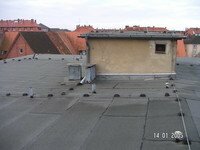 Disposal and processing companies demand that roofing felt waste be tested for asbestos and artificial mineral fibres. SBB demands that the 'BIA method 7487', which is not suitable in every case, be used as the type of test. 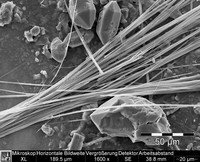 Why asbestos causes certain diseases such as asbestosis or "asbestosis" has not yet been conclusively proven. 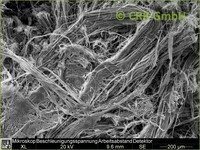 Analytik News reported that researchers have found out how asbestos fibres damage the body in such a way. 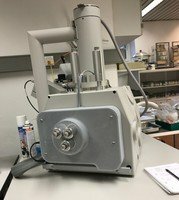 CRB has purchased a fourth scanning electron microscope which will be put into operation in March 2018. This represents a 33% increase in capacity for the asbestos analysis laboratory. We have always known it and congratulate! 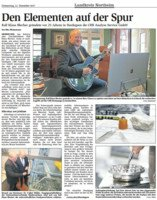 The Göttinger Tageblatt reported today that Blackbit was the only agency in southern Lower Saxony to be awarded the quality certificate for search engine advertising. We would like to congratulate our long-standing partner Blackbit on this award - the outstanding online marketing strategy and digital sales of CRB's asbestos analyses speak for themselves. 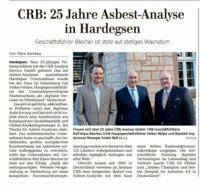 At the beginning of the year, the Göttinger Tageblatt took our 25th anniversary as an opportunity to report on the history and development as a future-oriented asbestos analysis laboratory from Hardegsen. 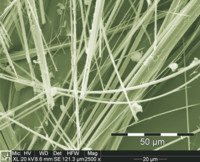 The central topic was the expansion of the successful digital strategy in Europe, which primarily supports private customers in identifying dangerous asbestos fibres in their homes and yards. In order to ensure the quality of our test procedures, we regularly take part in interlaboratory comparisons. Because only the external control of a laboratory allows statements about the 'correctness' and comparability of measurement results. Last year, we were able to shine with 100 percent accurate results in all four interlaboratory comparisons of our asbestos analysis process. Under the heading "On the trail of the elements" Mr. Niko Mönkemeyer from the HNA reported about our laboratory and interviewed our managing director Ralf Klaus Blecher about the development of the company and the importance of modern analysis technology. What does it look like in an asbestos testing laboratory? 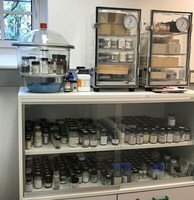 Explore our offices and labs with Google Street View to see how we test your samples for hazardous substances such as asbestos or artificial mineral fibres using accredited analytical methods. 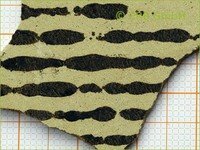 Inconsistent requirements of the new VDI 3866, Sheet 5 of June 2017 on sample preparation and analysis of asbestos samples complicate the work in the asbestos laboratory when testing plasters, fillers and tile adhesives with asbestos contents < 1 mass percent. 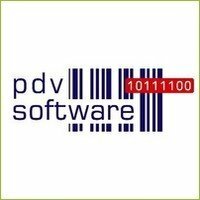 pdv-software implements new sample storage system into LIMS. 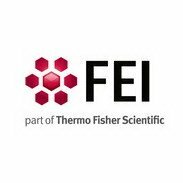 CRB buys 3rd REM, a Quanta 650 from FEI, to expand its laboratory capacity. The new version of the guideline VDI 3866, part 5 leaves the draft stage after 2 years. 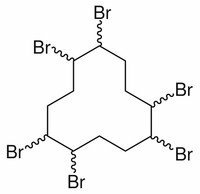 Since April 24, 2017, Dr. Breitenstein, a graduate chemist, has strengthened the CRB team in the field of asbestos analysis. In Germany, insulating materials made from polystyrene (PS) – Styrofoam with a content of HBCD higher than 1000 ppm are classified as hazardous waste since the 30th of September 2016 according to so-called POP-regulation, part of the Stockholm convention list and the German Waste Catalogue, Abfallverzeichnisverordnung, AVV. Reporting system for the analysis of material samples is being converted.